Because of our history with rescue critters, and also our own Padsworth's Project, we have a special place in our hearts for kennel quilt efforts. Recently we received a plea for help, and I wanted to pass it along in case some of you could assist these fine folks. 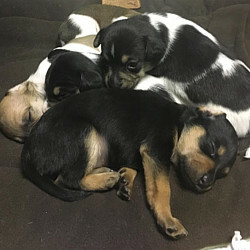 The Quilt Pattern Magazine Small Kennel Quilt Team has received a request for kennel quilts from Petfinder -- a Louisiana shelter would appreciate having some kennel quilts for their rescued puppies and small dogs. And click here for the form to send with your donation. 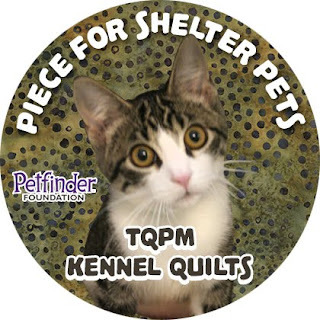 TQPM encourages everyone to send photos of your kennel quilts to their Facebook page before you mail them off. That way, we can all enjoy the fun of quilting and helping these furry friends! Not sure quite how large to make the kennel quilts? Check out the instructions at this link! We applaud these folks in their efforts to help kitties and pups be ready and rested to greet their new owners when they come to call! Thank you so much for your help with the Piece for Shelter Pets effort in making Kennel Quilts to help various shelters. We appreciate all that you do for animals too. Jacob's Ladder blocks - a Fat Quarter Shop hop! Cabin Fever Party 2017 - and a giveaway!